FileAudit service: startup and stop. Database connection: failure and recovery. Database insertion: failure and operational again. Licensing: license issue and license ok again). E-Mail (failure and operational again). MS Access database size: a warning is displayed when the size of the database reaches 80% , an error when the database size has reached 100% (2 GB) and an information note when the database size is less than 80% again. FileAudit console connection to the audited server: failure and recovery. 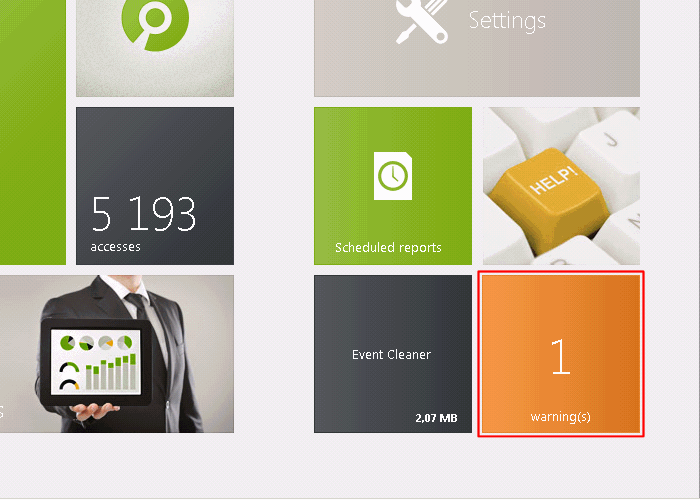 A dynamic tile is available from the hub to warn about potential issues encountered. The number displayed in the tile corresponds to the number of new events that have occurred since last opening the FileAudit console. Click on the tile to access the Warnings view. The warnings view displays the last ten issues the FileAudit service has encountered (if some). FileAudit allows you to get notified by Email for the different types of events encountered by the FileAudit service. 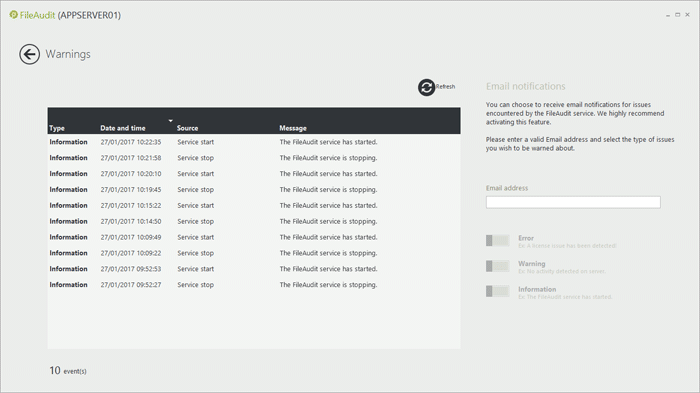 You can configure this feature from the Warnings view or the Service tab in the Settings view. We highly recommend you to enable this feature. 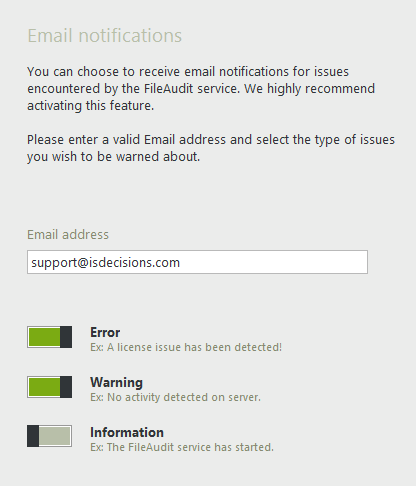 To enable the warning notifications, you must first add a valid Email address. Select the type of issues you wish to be warned about. An error label will appear if your Email settings have not yet been configured. Click on the error label to go to the Email settings. To disable the feature, leave the Email address empty or turn every switch off.